… usually! Because we bought some of our Christmas shopping online this year, we ended up buying 500g of nuts still in their shells. Which resulted in Dan taking a hammer to the nuts to get them out of their shells (no, we don’t own a nutcracker. The only nuts we usually ever buy in shells are pistachio nuts). The whole process took a good half an hour. But, after that, spicing the nuts was easy! On Christmas Eve I dry-fried the nuts in garam masala and celery salt, added some brown sugar, oil and rosemary, and then tipped them into a baking tray lined with foil. I then covered the baking tray with foil and left them until Christmas Day. Ten minutes before I wanted them on Christmas Day, I put them in the oven to heat through. Once they were heated, I added them to a bowl with a few sprigs of rosemary. And that was it. Admittedly, there are still nuts left lying around 3 days later, but they have been picked at over the last few days and make for a tasty alternative to more sweets and chocolate! I’ve loved the picture of this in Nigella’s Christmas book now, but couldn’t really find a reason to make it previously. It is, after all, basically just a big bowl of peas. Enter my son. He doesn’t eat much. But he always eats peas. I have to admit, I wasn’t 100% sure how this would go down – whilst he loves peas, these are peas with a twist. If you speak Italian, you’ll know what the twist is. Basically they have spring onions and lardons added, and are then cooked in double cream. Things went pretty well. My son was almost as enthusiastic about the lardons as the peas. 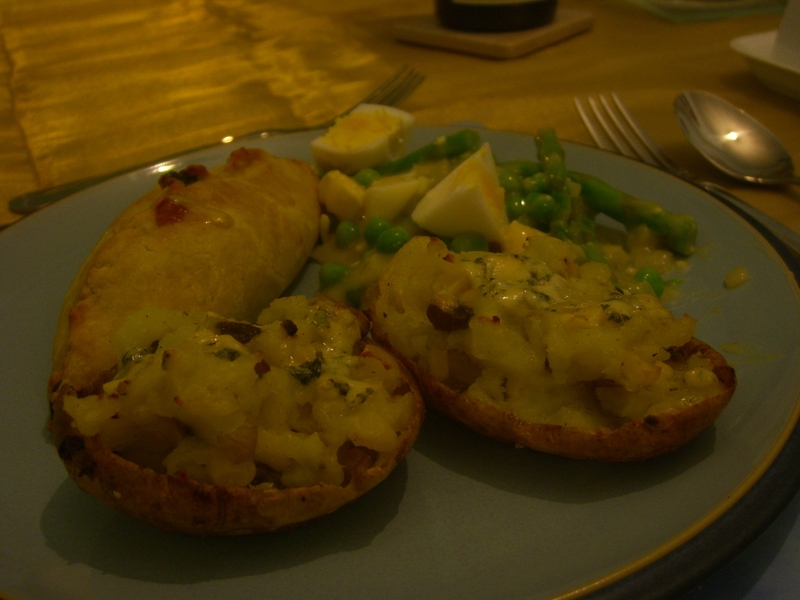 He didn’t eat as many of these as he would have a normal, plain plate of peas – but then they are much richer. I can also see why they live in Nigella’s Christmas book. Whilst not part of her main Christmas meal (they’re in the soups and sides section), I think they’d make a perfect veggie addition to a Christmas roast. They don’t require any roasting (and our oven is always horrendously overstuffed at Christmas), and take all of about 5 minutes to cook – with not a lot of intervention. So you can get on with making the peas and brussel sprouts whilst somebody else is cajouled into making the gravy. And yes, I am now planning Christmas in May. At least it’s not February. NB: I wrote this post back in early May, when I actually cooked this dish. Presumably I was waiting to take a photo before I posted it. But that photo never got taken, and therefore this never got posted. So you’ll just have to imagine what peas and lardons covered in cream looks like! And so, on to our Valentines Day meal. 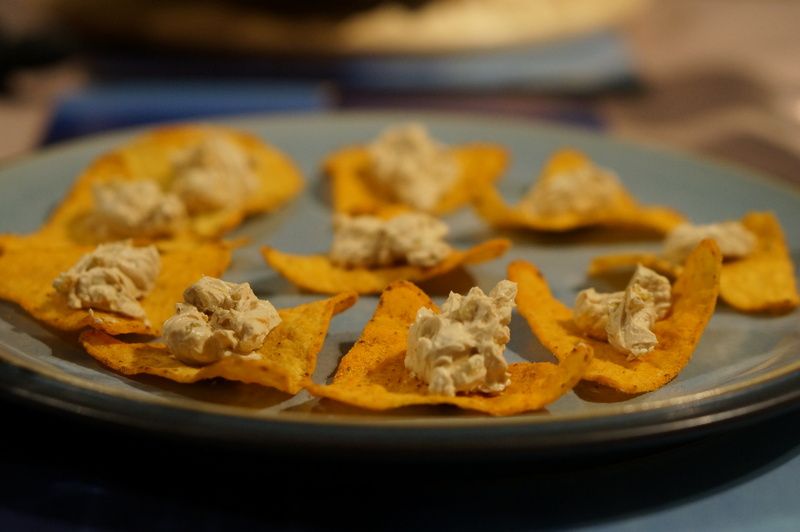 For a starter, we made chilli cheese crostini. 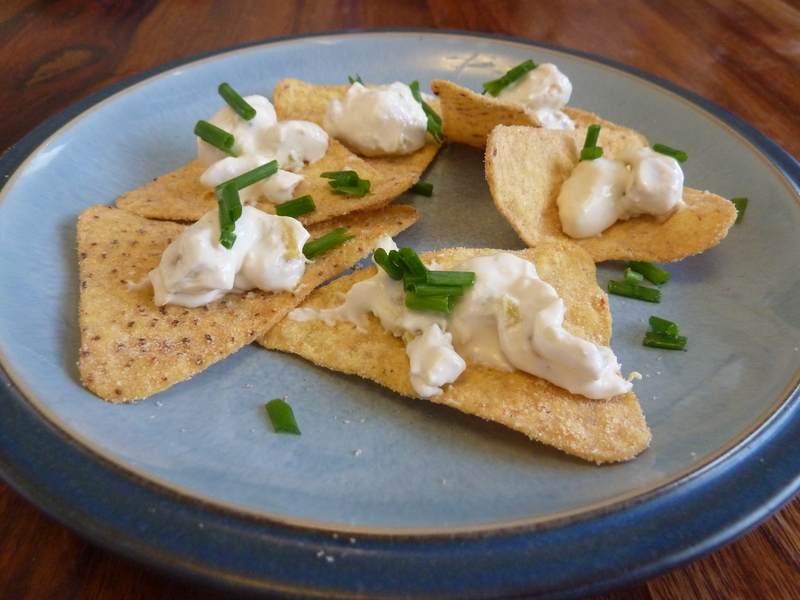 These are pretty similar to the double blue crostini I made back in January – but instead of a mixture of blue cheese, cream cheese, sour cream and jalapenos, you mix together cream cheese, sour cream, paprika, jalopenos and Worcestershire sauce to make a coral pink mixture. Except that we had run out of sour cream, and I replaced the Worcestershire sauce with dark soy sauce so my veggie husband could eat them. Not having sour cream in these did make a difference, but it wasn’t the end of the world. They would have tasted nicer with it, but they were fine without too. The massive benefit of making these was that they take two seconds to do (and about the same time to devour), so the fact that our main course was already ready to be eaten didn’t matter too much. Not as good as the double blue crostini, but a good alternative if you have no blue cheese in the house! Next up was the homemade olive and fennel bread. I’ve never made bread before, but this was the February recipe from my 2014 Home Baking calendar. I had been looking forward to making whatever this months recipe was, so when I saw it was bread I figured I would give it a go. I made this on Valentines Day afternoon, when I had the afternoon off work. It was fun to do because, for a rare treat, I had the house to myself. Of course, it was more fun once I had fixed the “oops, I’ve failed to buy any bread flour” problem – by dashing out to the shops and buying some! Making bread is a pretty involved process, and this even more so because you need to add fennel seeds and kalamata olives to it. I did realise that all those months of watching the Great British Bake Off had actually taught me something though – I knew vaguely what I was do from a relatively bare bones recipe, because I had seen it on TV so many times. The other thing I knew I needed to do was find somewhere warm to proof the bread. Conversations with friends had made it clear that if it wasn’t somewhere warm enough, the bread wouldn’t rise properly. After having a think, I concluded that the warmest place in the house was my 18 month old sons bedroom. I could turn the radiator up and shut the door, and essentially turn the whole room into a proofing drawer. Which I did, and which seemed to work out quite well. Although it did have the potentially undesired side effect of me thinking I needed to be quiet every time I walked past the room, because usually a shut door to that room means a sleeping baby… ah well, I’m sure the bread appreciated the peace and quiet. Overall, I think the bread worked out pretty well. 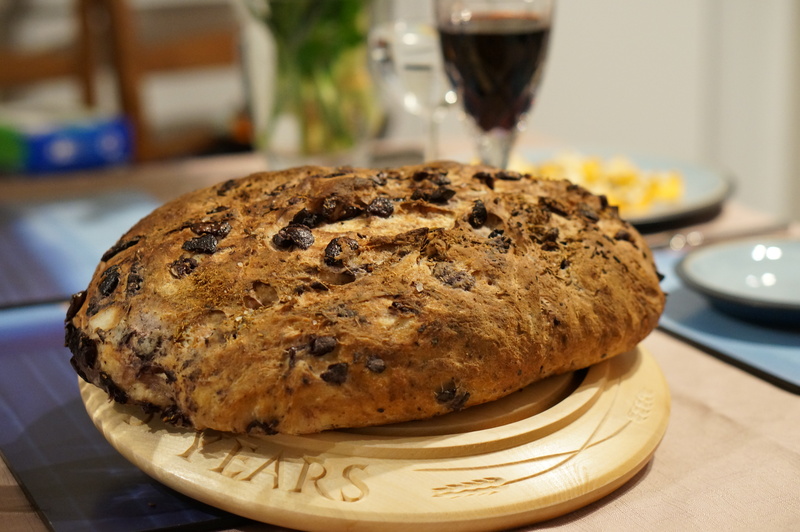 It wasn’t perfect, but it was edible, and tasted like pretty good bread – not bad for a first attempt. I may not make the exact same bread again (not that there’s any reason not to – they are pretty good flavours), but I’d definitely be willing to give more bread making in general a try. I had a friend coming over for a study session this weekend, which seemed like the perfect opportunity to try out a couple of new recipes. And it’s lovely! I wasn’t expecting this to taste so good. We ate the entire batch within 30 minutes of my friend arriving, long before we had sat down for lunch. I chose to add sweet yellow jalapenos rather than the recommended standard, hotter, green jalapenos, but you could use yellow, green or red ones, depending upon your preference. I’m not massively keen on really hot things, and for me yellow jalapenos worked really well. This is definitely something I’d make again. I’m not even sure I need an excuse to do it, I’ll just randomly make them one day. This sauce is exactly what it says it is – a mix of redcurrant jelly and whole grain mustard. You basically just mix the two together (although I had to warm the mixture up to get the two ingredients to meld properly). I made it to go with the Aromatic Christmas Ham, and it worked well with that – and to dip the bacon-wrapped chipolatas into as well. A nice easy, but pretty decent tasting, sauce. Dan didn’t want to include info about these on the blog, as they’re ‘just sausages wrapped in bacon’. Well, yes, they are sausages wrapped in bacon. But there’s no just about it. They are one of my favourite things. Ever. Silly vegetarians who don’t understand these things. It also takes up a whole page in Nigella’s recipe book, so I didn’t want to do my lovely chipolatas the injustice of not including them here. Having said all that, after having read the first couple of sentences of the recipe, my friend and I basically just went ahead and made these guys the way I normally do (which, it turns out, was pretty similar to what the recipe said – as I discovered upon reading it a day later). They’re not difficult to make; you get a chipolata, take a piece of streaky bacon and wrap it around the sausage. Don’t use too much bacon or it falls off. Don’t use too little bacon or it falls off. Obviously though, more is better than not enough. Then put them in the oven with anything else you’re roasting for about 30 mins. Have a look at the pic under the ‘Aromatic Christmas Ham’ post for a glimpse of these guys. These cheesy bites are a tasty savoury treat. Flour, butter, cheese. Yes, you might expect these from cheesy nuggets. Add mustard, paprika and onion and things are looking a little different. 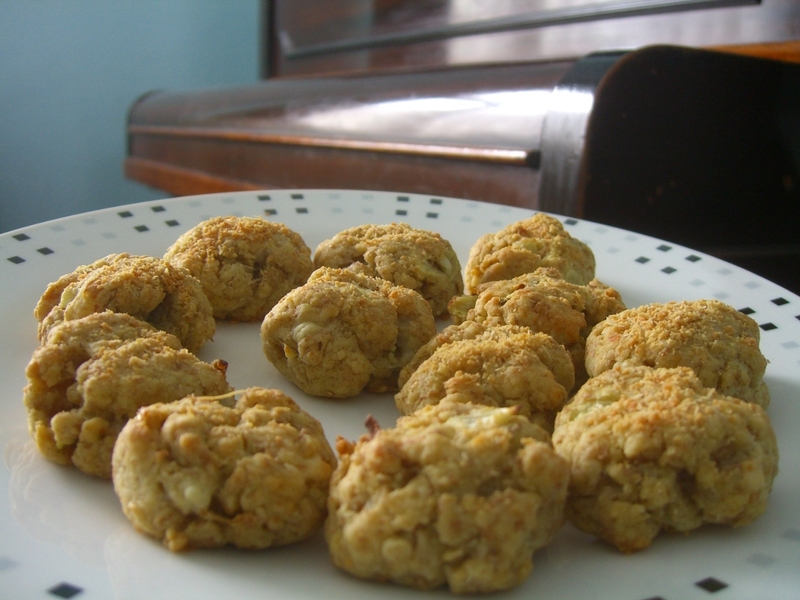 Something between a pastry and a scone, these little guys are as tasty as they are confusing! Best fresh, they do keep fairly well and would probably be awesome with a garlic dip. But they are a tasty little bitesize snack. Recipe: “Baking making and sharing” by Susan Over, page 54.